VisionLink® can help you reduce costs and increase efficiency, no matter what your operational needs are. With VisionLink you can make the right decision at the right time. VisionLink is a secure, web-based application that integrates site productivity, material quantities and materials movement with asset and fleet management so you can have a holistic view of your site. By centralizing and simplifying the management of on-site operations to maximize efficiency, you can raise productivity and lower the costs of your entire fleet. With VisionLink you will not only know when and where your equipment is working but you can also examine asset utilization. Minimize idle times to reduce depreciation and eliminate unnecessary and costly fuel burn as well. You can optimize haul operations with VisionLink with the ability monitor excavator and wheel loader payloads. VisionLink gives you the ability to see continuously updated surface models based on machine activity. With the information and analysis you gain with VisionLink you can manage and make information decisions about production efficiency. Schedule reporting of business-critical information, such as volume and quality assurance data, allows you to easily and more accurately create billing, inspections and project progress reports. VisionLink’s subscription model offers several plans for you to choose from or add on to. The Basic Plan allows you to see where your equipment is, bill it to the correct project and locate it for pickup, maintenance or refueling. The Basic Plan can also be set up with site boundaries to create triggers for theft mitigation, inappropriate machine use and compliance with avoidance zone. Machine hours can also be monitored when you have the basic VisionLink plan. By monitoring machine hours you can manage machine maintenance and help decrease equipment depreciation costs. Data sharing can be automating and accuracy ensured by integrating report data from VisionLink into ERP or project management applications. The Basic Plan of VisionLink is required for all other VisionLink plans. Other plans available for VisionLink include Rapid Reporting, Utilization, and Machine Health. Rapid Reporting sends you reports every 10 minutes containing 1-minute interval data for dispatch, delivery and haul monitoring applications. The Utilization plan allows you to compare working day hours, runtime hours and working verse idle time, which can help you minimize idle time while increasing fuel economy, efficiency and productivity. The VisionLink Machine Health plan allows you to monitor tire pressure and temperature of every rubber tire in your fleet so you can proactively manage and schedule preventative maintenance to extend tire life, promote fuel efficiency and avoid dangerous blowouts. VisionLink also has plans for 2D & 3D Project Monitoring. The 2D Project Monitoring Subscription Plan allows you to monitor cycle time and load counts to track actual against planned and monitor job site productivity. You can track materials movement to remove contaminated materials from the job site with 2D Project Monitoring as well. Or use structural and non-structural materials in the correct site location. With 2D Project Monitoring you can rectify problems in a timely manner and provide more accurate completion time estimates to keep the job on schedule. 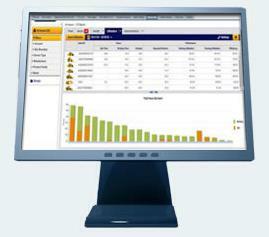 You can also monitor productivity against plan to maintain production schedules and make decisions in near real-time. The dashboard provided in this subscription plan is customizable so you only see the information that is important to you. 2D Project Monitoring does require the Trimble® SNM940 Connected Site® Gateway and includes the VisionLink Asset & Fleet Management Universal subscription plan. The 3D Project monitoring Subscription plan is ideal for earthmoving and grading applications as well as compaction. For earthmoving and grading, you can use VisionLink to continuously monitor and record 3D earthmoving, grading and finishing operations through the life of the project. The information provided can also be used to make timely decisions regarding equipment use and deployment. Near real-time 3D surface models, elevations and cut and fill maps can be created to show progress toward completion without the need to drive o the site to ensure you have the most current information. 3D Project Monitoring can also help you get paid for any extra work you perform as you can accurately capture all work completed, including over-excavation and backfill, overfill or surcharge and cut back operations. 3D Project Monitoring requires the Trimble SNM940 Connected Site Gateway, a Trimble or Cat® AccuGrade™ GCS900 Grade Control or CCS900 Compaction Control System. This subscription also includes VisionLink Asset & Fleet Management and Connected Machine subscription plans. When it comes to compaction, a 3D Project motoring subscription plan can help you improve testing success, reduce rework and lower ongoing maintenance costs with the ability to continuously monitor pass counts and compaction meter values over the entire area of compaction and on all material layers. 3D Project Monitoring can also help in reducing over-compaction, optimizing fuel use and machine time and increasing the finished surface quality. Increase surface quality and operational life by ensuring uniform lift thicknesses and consistent compaction pass counts and meter values. Asphalt compactors fitted with temperature sensors can have temperature maps monitored to ensure compaction per the project’s specified temperature range.